Wherever, I go, Mick is always close behind. Even the relationship between him and my husband is better, he takes him out for me now. 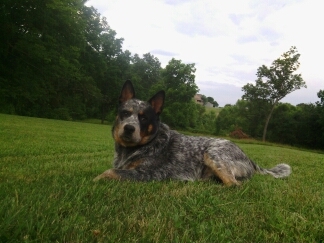 My husband even said he would like to go and see a working cattle dog. I have taken many different types of classes with Rose over the years (Agility, Obedience,Puppy, Scenting, etc). I could not have asked for a better, trainer, mentor and friend. I regularly get comments on how well behaved my dog is and I owe it to Rose. Without her help, guidance and a encouragement I would not have learned to be a great handler, resulting in a great dog. Big hugs from Wrangler and I, we miss you dearly! When I rescued our little Dachshund Jake he came with a lot of "baggage". He had severe aggression issues and he needed an experienced trainer who was willing to take their time with him (and me!) The first time I met Rose, I knew right away she was dedicated to helping me help my dog. She has so much knowledge and understanding of dog behavior. It was only with her help that I can now confidently take Jake into public situations without the fear of him being aggressive towards people or other animals. After attending private lessons and group classes, he is a different dog. Not to mention I have a much better understanding of dog behavior in general which I believe makes me a better dog owner. 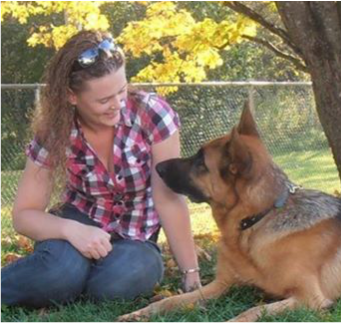 I am 100% satisfied with the amazing experience I had with Cold Creek Dog Training and dog trainer Rose DeLuca! Rose you are truly a great teacher. Before I met you I knew nothing of dog training. You have been a support and resource for me over the years. You have seen me through the adoption process and loss of 3 dogs since we first met in 2003. They all had a better life because you enabled me to be a good owner and make good training decisions. The dog I have now, which I was able to adopt from you, is also a really well trained, well adjusted dog I can take anywhere, all due to the classes I took with you and the knowledge I gained there.